In my last post, I photographed the back of the Prince of Wales Hotel, and mentioned that it was so windy that it was hard to hold the camera still to take a picture. 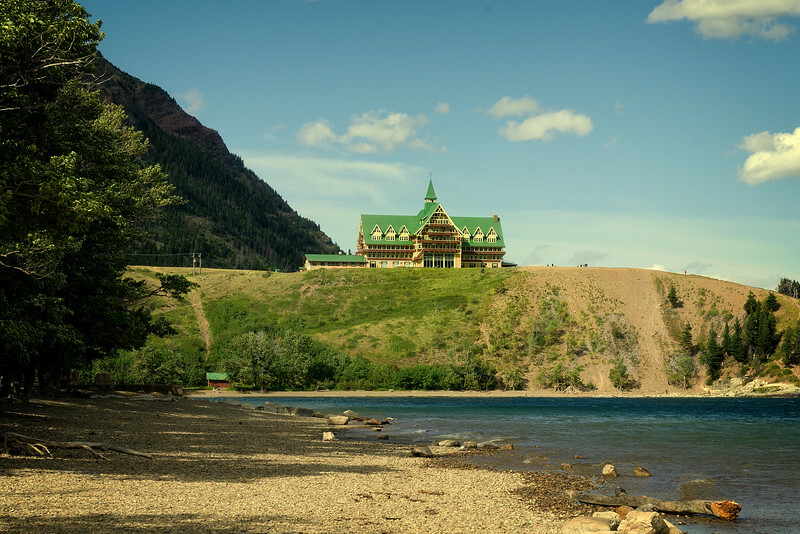 We stayed in a different hotel (Bayshore Inn), near the Prince of Wales (PoW), but more in the town of Waterton Park, Alberta. Behind the hotel is the shoreline of Waterton Lake. We took a walk along the lake, and saw this angle of the Price of Wales from the shoreline. As you can see the PoW Hotel is up on a bluff, with nothing to block the winds when they blow !